The Rams offensive gameplan was fairly simple in this divisional game against the 49ers; establish the run with Todd Gurley and then use the play action passing game over the top. The Rams found their inside zone running scheme working and just continued to go back to it over and over. Ultimately, the 49ers were unable to stop it. Jared Goff took advantage of a beat up 49ers secondary early and often on Sunday and the Rams were able to utilize their downfield threats in Brandin Cooks and Robert Woods to hit the 49ers over the top. 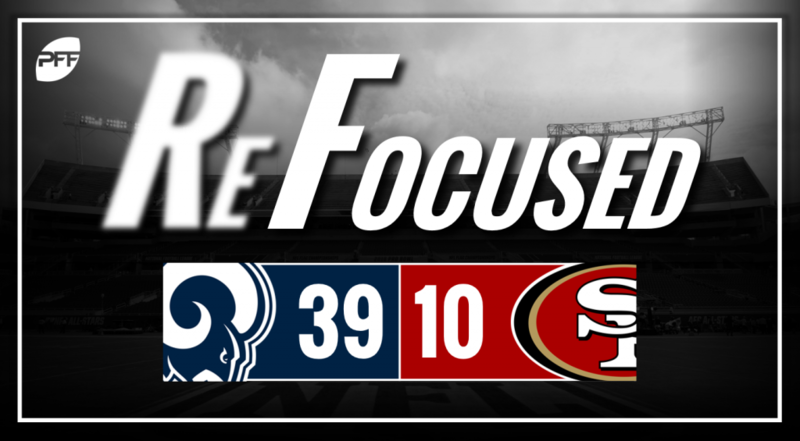 Those big passing plays along with a dominant running game allowed the Rams to put a bunch of points on the board and put it out of reach of the 49ers’ sputtering offense. Aaron Donald turned in another monster defensive performance. Donald stripped running back Matt Breida on his way down to the ground and recovered the fumble all in one motion to end a 49ers’ first-quarter drive. Donald also notched three sacks, one on a bull-rush of center Weston Richburg and another two going outside right tackle Mike McGlinchey. Backup quarterback C.J. Beathard struggled for most of the evening and ended the game with two interceptions next to his name. Cornerback Troy Hill got the first one, by cutting off an in route in coverage against Marquise Goodwin in the second quarter and safety John Johnson III got the second from a heavily contested pass. George Kittle continues to be a focal point for the 49ers’ pass-game. Kittle was targeted on Beathard’s first pass of the game and was routinely targeted throughout the game. Kittle caught a 35-yard pass late in the second quarter after squatting behind a linebacker in zone coverage and then quickly turning up-field and showcasing his run after the catch ability. He did have a red zone drop, but he followed it up with a contested catch for a touchdown late in the first half. The 49ers struggled to cover the explosive Rams wide receivers down the field and gave up far too many big plays as a result. With Richard Sherman out, they were forced into using their backups in more prominent roles, and they struggled against the Rams’ high-powered passing attack. The 49ers defense looked promising in the early stages of the first quarter, but their interior defensive line was unable to come up with answers for the Rams inside zone running scheme. Los Angeles: The Rams offense was slowed at the start of the game, but it was only a matter of time until they were able to break through and put up points. San Francisco: The 49ers turned the ball over too many times to remain competitive in the game.